International trade and investment are important engines of growth, productivity, innovation, job creation and development, the leaders of the G20 countries, including India, said in a joint statement on Saturday. The European Commission in its statement said, "We recognise that the benefits of international trade and investment have not been shared widely enough. We need to better enable our people to seize the opportunities and benefits of economic globalisation. We agree to exchange experiences on the mitigation of the adjustment costs of trade and investment liberalisation and technological change, and on appropriate domestic policies, as well as to enhance international cooperation towards inclusive and sustainable global growth." Rejecting emerging protectionist trends, the G20 countries, including India, agreed to keep the markets open and fight protectionism, including all unfair trade practices and hinted at advancing the implementation of international standards on transparency to fight corruption, tax evasion, money laundering and terrorist financing. In a major step against black money generation, the Hamburg Action Plan adopted at the end of the two-day summit of developed countries and emerging economies called on all relevant jurisdictions to begin the process of automatic exchange of financial account information under the common reporting standards by September next year. They pledged to the implementation of Base Erosion and Profit Sharing (BEPS) package to check tax avoidance by entities which actually shift profits to low or no-tax locations. On Friday, Prime Minister Narendra Modi, in his speech at the Summit, said the rise in protectionism threatens gains from globalisation. "G20 must speak in one voice to support and sustain a regime of openness. 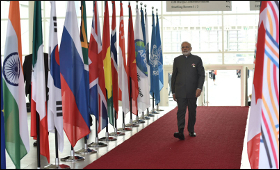 We hope that the G20 will assume leadership to act on all important issues," Modi said. "We will keep markets open noting the importance of reciprocal and mutually advantageous trade and investment frameworks on the principle of non-discrimination and continue to fight protectionism, including all unfair trade practices and recognise the role of legitimate trade defence instruments in this regard," the 12-page statement released by host German chancellor Angela Merkel said. The countries, including the US, France, Japan and Russia declared they will strive to ensure a level playing field, in particular by promoting a favourable environment for trade and investment in this regard. "We underline the crucial role of the rules-based international trading system. We note the importance of bilateral, regional and plurilateral agreements being open, transparent, inclusive and WTO-consistent and commit to working to ensure the complement the multilateral trade agreements," it stated. On international tax cooperation and financial transparency, the group of 20 nations said they will continue their work for a globally fair and modern international tax system and welcome international cooperation on pro-growth tax policies. "We remain committed to the implementation of the Base Erosion and Profit Shifting (BEPS) package and encourage all relevant jurisdictions to join the Inclusive Framework. We look forward to the first automatic exchange of financial account information under the common reporting standard in September 2017. We call on all jurisdictions to begin exchanges by September 2018 at the latest." The Summit also said defensive measures will be considered against listed jurisdictions. "As an important tool in our fight against corruption, tax evasion, terrorist financing and money laundering, we will advance the effective implementation of the international standards on transparency and beneficial ownership of legal persons and legal arraignments, including the availability of information in the domestic and cross-border context," the leaders said. The leaders noted that international investment can play an important role in promoting inclusive economic growth, job creation, and sustainable development which requires an open, transparent and conducive global policy environment. "We will seek to identify strategies to facilitate and retain foreign direct investment," the declaration said. Briefing the media, Arvind Panagariya, Vice chairman of Niti Aayog and India's Sherpa at the Summit, said there was opposition to all forms of protectionism. On sharing the benefits of globalisation, the Summit felt current growth prospects are encouraging though the pace of growth is still weaker than desirable. "We reaffirm our commitment to international economic and financial cooperation to further strengthen growth and safeguard against downside risks. We will continue to use all policy tools - monetary, fiscal and structural - individually and collectively to achieve our goal of strong sustainable, balanced and inclusive growth while enhancing economic and financial resilience," the statement said. Samir Khare, Joint Secretary in India's Ministry of Finance, said that there was concern about how to use monetary and fiscal policies and financial resilience was discussed. "Monetary policy should be used to protect global economy," Khare said. "The international finance architecture should reflect current realities and should provide a global safety net." Good PPT on invoice preparation. How about having administrative office and dispatch location in different states. In other words how to deal with a vendor having multiple manufacturing or dispatch points.